Cemented hip arthroplasty is one of the most successful procedures of modern surgery. However, attempts to extend this procedure to younger and more active individuals using cemented or cementless methods of fixation have met with mixed success. Cementless procedures still have an unacceptable incidence of pain and limp at follow-up. These symptoms appear to be related to the presence of localized areas of instability of the stem/bone interface secondary to inadequate proximal or distal fixation. In addition, an alarming complication of some cementless prostheses is focal osteolysis which appears to arise from a foreign body reaction to particulate debris generated by motion between the implant and bone. Continuing advances in cementless arthroplasty will arise from a systematic approach to implant design leading to more anatomic stems, greater integration of implants and instruments, and increased attention to the impact of surgical technique on implant/bone fit and the stability of cementless fixation. The results of cemented arthroplasty also continue to improve. Retrospective studies of retrieved implants have shown that the fundamental cause of aseptic loosening and focal osteolysis is fragmentation of the cement mantle. This complication can be minimized through use of implants specifically designed for cemented fixation, centralized within the medullary canal with proximal and distal centralizing devices which guarantee a minimum thickness of bone cement. 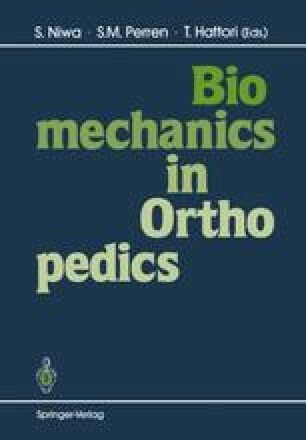 In terms of the biomechanics of the hip joint itself, hip replacement can be enhanced yet further through greater attention to restorating the anatomic relationship between the femur and the acetabulum. This necessitates the use of femoral components which increased head offset and coordination of the position of the femoral head with the shape of the femoral stem. In the acetabulum, cementless fixation has been particularly successful in the short term. However, dependable fixation of acetabular cups sometimes necessitates adjunctive the use of bone screws which has led to a small but serious incidence of neurovascular complications. The morbidity of screw fixation within the pelvis may be minimized if bicortical screw purchase is avoided and if screw placement is restricted to areas of thickest available bone. Solutions are still awaited to many unsolved challenges in total hip replacement. These include increased wear-resistance of the articulating surfaces, a truly biocompatible implant/bone interface and greater retention of cortical bone in the presence of rigid component fixation.